And now we return to 1982. We have seen the future of theropods, now let us turn to the future of sauropodomorphs. One future was that of Supersaurus and Ultrasaurus, a future of every large sauropod having to out-superlative the sauropod before it. This future petered out before it got any farther, kneecapped by an honest mistake half a world away and a terminal case of bonebed chimerism. Another future was that of Roccosaurus, the fanged prosauropod, and it was a terrible bleak cheesy early-'80s dystopian future, with leather and chains and synthesizers. That future never came to pass. 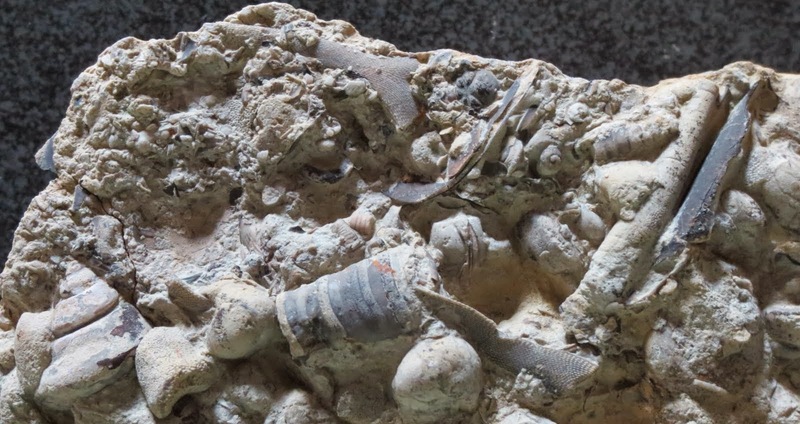 Others involved overlooked fossils from Portugal and central Asia taking their rightful places, or promises of skulls from India, or an unusual elongate cervical vertebra from Wyoming, or a skeleton from Tendaguru. The "Blikana dinosaur": This was resolved as Blikanasaurus in 1985. This is all that Glut (1982)'s Addendum II has for "prosauropods", but there are several other relevant things scattered throughout the book that merit mention. First off is the 1970s–1980s mania for synonymizing prosauropods. Something about these dinosaurs seems to make people lose their minds. In the 19th and early 20th centuries, this manifested itself in the piles of genera and species for European and African forms. In the late 20th century, it manifested as the opposite. As included in Glut's book, people were suggesting that Melanorosaurus was Euskelosaurus (along with Eucnemesaurus and Plateosauravus, although to be fair they hadn't received much interest before and didn't get a hearing for another twenty years), that Yunnanosaurus was a juvenile Lufengosaurus, and that Lufengosaurus was Massospondylus or Plateosaurus, which could result in making Massospondylus Plateosaurus in the bargain. It was as if people had discovered that not only could you name new genera and species, you could also synonymize them, and they got a little carried away. Finally, Glut (1982) includes one of the most persistent informal names in dinosaur paleontology, "Thotobolosaurus". The bones have been known long enough that they have acquired two other informal names (the "Maphutseng sauropodomorph" and "Kholumolumosaurus ellenbergorum"), as well as having done a stint in Euskelosaurus Prison like all good African basal sauropodomorphs. "Supersaurus" and "Ultrasaurus": You probably know how this played out. Supersaurus turned out to be a diplodocid instead of a brachiosaurid, and Ultrasaurus must have been one superlative too many for the taxonomy gods to accept. It was accidentally pipped at the post by a decidedly non-ultra sauropod from Lower Cretaceous rocks of South Korea, necessitating a name change to Ultrasauros, followed by the discovery that the putative "Ultrasauros" fossils were a chimera of Supersaurus and Brachiosaurus bones. Because the individual specimen selected as the type was a Supersaurus bone (a dorsal vertebra, to be exact), Ultrasauros is a synonym of Supersaurus. Apatosaurus alenquerensis, interestingly referred to as a brachiosaur: This Portuguese species was given its own genus, Lourinhasaurus, in 1998. It represents some kind of moderately basal sauropod, most recently a camarasaurid. Jensen's camarasaur: this specimen was named Cathetosaurus lewisi in 1988, but was generally considered another species of Camarasaurus until the past couple of years. "Morosaurus" agilis, also referred to as a brachiosaur: spin the wheel. Other suggestions over the years have included a specimen of Haplocanthosaurus (a perennial favorite first hinted by Gilmore ), a "cetiosaurid" (McIntosh 1990), and a juvenile Diplodocus longus (Tidwell et al. 2005); it may well be a diplodocid but the taxonomy of diplodocids is not what it used to be. 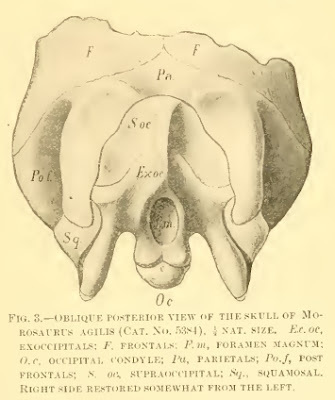 With these in mind, it may be that "M." agilis is not a fossil at all, but a malign and petty intelligence which has manifested itself in the form of a sauropod braincase and three anterior cervicals, and which has the power to subtly alter its appearance so that every observer sees something different. Anyway, the "brachiosaur" reference probably stems from Gilmore's paper, which refers to Haplocanthosaurus as a brachiosaurid. Should you like to try your hand, "Morosaurus" agilis presently resides in the National Museum of Natural History, under the deceptively benign USNM 5384. Pictured: the star of one of Lovecraft's less heralded works, "The Garden Park Annoyance". From Glimore (1907). A long cervical from the Cloverly Formation: Ostrom (1970) reported a handful of sauropod pieces-parts from the Cloverly, and D'Emic and Foreman (2012) assigned some of them to Sauroposeidon. In the absence of any other descriptors than "a long cervical centrum" possibly of Pleurocoelus, I suspect that the specimen is YPM 5294, a middle cervical centrum among the batch assigned to Sauroposeidon. A dorsal vertebra from Kweichow [Guizhou] with the neural spine flattened fore-aft instead of laterally: This is a mystery to me. I think it is a reference to Young (1948). However, consultation of "The Dinosauria"'s locality index finds no dinosaurs reported from Guizhou. Guizhou *is* known for early plesiosaur relatives, but namesake Keichousaurus was found in 1957, it's not of sauropodous proportions, and it's from south Kweichow, unlike the material published in 1948. Anyway, I have a request out for this article, so we'll see what happens. A "sauropod from Fergan": This was one of the longest-standing rumors by the time Glut's book was published, and would wait another two decades to finally come to fruition as Ferganasaurus verzilini. Two sauropod skulls from the Kota Formation representing two different genera: To date, there has been no formal description of sauropod skulls from the Kota Formation. Coincidentally, there are two sauropod genera described from the Kota Formation (Barapasaurus and Kotasaurus), neither of which has a skull. The "Winton sauropod", "Hughenden sauropod", and "Lightning Ridge sauropod": One of these is easier than the others. The "Winton sauropod", the "Austrosaurus sp." of Coombs and Molnar (1981), is at least in part Wintonotitan. Specifically, the humerus F7292 is part of the holotype of Wintonotitan (Hocknull et al. 2009). The "Hughenden sauropod" remains unnamed, but is only known from a single bone. Its claim to fame was as the largest dinosaur known from Australia, but it has since been overtaken. Primarily it serves as a secret handshake for dinosaur enthusiasts of a certain age. In the absence of context, the "Lightning Ridge sauropod" may be the animal mentioned here. "The first sauropod known from the Kallamedu Formation": Bruhathkayosaurus again? A Nemegt Formation sauropod to be described by Kurzanov and Bannikov: This rumor turned out to be Quaesitosaurus, named in 1983. The M23 sauropod from Tendaguru: This specimen is currently under study; you may know it as "the Archbishop". I'll let Mike Taylor at SV-POW! have the last word on it (and it's not really M23 anything, unless you count the quarry). Coombs, W. P., and R. E. Molnar. 1981. Sauropoda (Reptilia, Saurischia) from the Cretaceous of Queensland. Memoirs of the Queensland Museum 20(2):351–373. D’Emic, M. D., and B. Z. Foreman. 2012. The beginning of the sauropod dinosaur hiatus in North America: insights from the Lower Cretaceous Cloverly Formation of Wyoming. Journal of Vertebrate Paleontology 32(4):883–902. Gilmore, C. W. 1907. The type of the Jurassic reptile Morosaurus agilis redescribed, with a note on Camptosaurus. Proceedings of the United States National Museum 32:151–165. Hocknull, S. A., M. A. White, T. R. Tischler, A. G. Cook, N. D. Calleja, T. Sloan, and D. A. Elliott. 2009. New mid-Cretaceous (latest Albian) dinosaurs from Winton, Queensland, Australia. PLoS ONE 4(7):e6190. McIntosh, J. S. 1990. Sauropoda. Pages 345–401 in D. B. Weishampel, P. Dodson, and H. Osmólska. The Dinosauria. University of California Press, Berkeley, California. Ostrom, J. H. 1970. Stratigraphy and paleontology of the Cloverly Formation (Lower Cretaceous) of the Bighorn Basin area, Wyoming and Montana. Peabody Museum Bulletin 35. Tidwell, V., K. Carpenter, and C. Miles. 2005. A reexamination of Morosaurus agilis (Sauropoda) from Garden Park, Colorado: Journal of Vertebrate Paleontology 25(supplement to 3):122A. Van Heerden, J., and P. M. Galton. 1997. The affinities of Melanorosaurus—a Late Triassic prosauropod dinosaur from South Africa. Neues Jahrbuch für Geologie und Paläontologie, Monatshefte 1997:39–55. Young, C. C. 1948. Notes on the occurrence of sauropod remains from N. Kweichow. Science Record 2:200–206.